I just got a Summer Carnival '92 Recca famicom cart from ebay. The japanese seller has a good reputation and sold heavies like this in the past, but I noticed the board's connectors is unlike any ever seen. I just can't find PCB scans of Recca on internet. And when I try to compare the connectors from the bottom of the cart, I see different shape of connectors. The 2 first pictures are my cart, the 3rd one is from another ebay auction. Notice the difference between the 2 pictures of the front of the cart. My cart's connectors are rounded edge and the middle part is different too. Is there possible that different PCBs were use for the same release ? 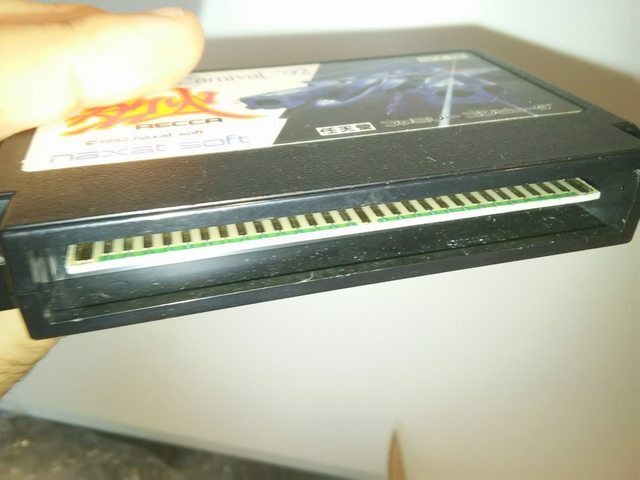 Can someone confirm that it is a legit copy of Recca and not a repro board ? Thank you for your help. ! Apparently, it's both very rare and impossible to open without damaging the cartridge...which is why there are no scans of the board. And I looked for one. Here's a picture of a fake, maybe that will help? Recca is impossible to open without damaging the cart? It looks pretty much identical to most other FC carts, and there's a method to get those open without damaging them (though it's a little obscure). If there's a special case for Recca, I'd love to know, because at some point I'm definitely planning on opening mine. Funny how I've run into this exact post at three different places that I frequent now. OP unfortunately came to the conclusion that his cart is a fake. Here's a picture of mine which I'm pretty sure (ie. which I hope) is legit. Famicom carts are a little difficult to open without damaging at first, but with practice you can do this very easily. You must use just enough force on the sides of the case to "disengage" the grooves then slightly pull it down and to front. Try in some games you wouldn't mind breaking first, if possible. Other option could be some x-ray machine, but I think that's a little expensive, unless you know someone who works with one. Maybe the guys at the airport can help? It's crazy that no PCB photos exist of Recca, one of the most desirable NES/FC games to bootleg. Are there any other high-profile valuable games where this is the case? I have a few in my collection and might have to start having a go at it. I'm sure the NES Cart Database would appreciate photos and dumps of Recca. Yeah that would be nice. It's a rare game so not many people want to risk opening it. I've been successful using the quick grip method to open Famicom cartridges. One problem with Famicom cartridges is that since developers originally made their own carts there are so many types made from different kinds of material. Some gets hard and brittle while others get soft and mushy (like my Famicom BASIC cart), then we have the modern pirates made of brittle papier-mâché. Fortunately, the Recca cart is very much the "standard" type of Famicom cartridge though. Completely identical to the one in that video. I don't mind opening mine, but it's definitely not going to be the first one I attempt. Most of RECCA carts on ebay are reproductions. It's easy to distinguish by quality of label printing and how carefully the corners are made. Last edited by pakosup on Thu Aug 30, 2018 12:00 am, edited 1 time in total. There's 12 Recca Famicom carts on eBay now, which is rare, and most of them are even boxed. I'd "naively" rule out the boxed ones because bootlegging those would be even harder, which leaves 5 cart only listings. Only two of them look suspicious to me (and one of them I'd deem 100% original simply due to convincing wear and tear), but although I have no surefire way of identifying wether they are bootlegs, I know one of them are, as it's the seller OP bought his cartridge from. Do you have a way of identifying wether the other four are real? The western style NES carts are obviously bootlegs, but they aren't trying to pass off as the real thing. It is hard to say if some is real because photo quality not so good. Probably fakes have blurry photos on purpose. this one has "striped" label. So it is fake for sure.